Penicuik Curling Club was represented in this annual fun event on Sunday 25 March by ‘golfers and curlers extraordinaire’ Jim Ramsay, Dave Carr, Ronnie Hope and Dave Anderson. The golf has been played over Carricknowe Golf course, a fairly innocuous test of golf, for the previous three years. This year however, due to unforeseen circumstances, the golf was arranged at the Edinburgh Merchants Golf Club situated within the city between Comiston Road and Colinton Road which, if you have ever driven past it, you might appreciate is rather hilly and a much more challenging prospect, especially as it turned out we were subjected to gale force winds and squally showers on the day of the competition. As a team, we complimented each other very well with each member contributing positively to our overall score of 70 for the round, with at least 6-8 single putts of around 12–15 feet being a major feature of our game. By the time we reached the curling club we were fairly exhausted (bearing in mind we are all 65 years plus), but after some well-deserved refreshments we rose to the challenge of 6 ends of curling against Gill Black, Morris Anderson, Roger Scott and Iain McLeod representing Peebles Curling Club. Having lost the first end to a single, we drew a shot against five to level the scores and settle ourselves to take 2 shots then two singles to go into the last end 3 shots up where, unable to set a guard we lost a single to a well drawn shot. Our overall position was that we finished fourth out of six teams. We then retired to the Club rooms for a fine meal with fine fellowship accompanied by a few refreshments. A good time had by all but we really need to encourage more participants in this event in future years. This entry was posted in Uncategorized on March 25, 2019 by captainken45. Two rinks from Penicuik met two rinks from 37 Club on Monday 18 March for the annual social match. One Penicuik team consisted of Jim Ramsay, Murray Hope, Robert Beaton, and Ronnie Hope, and the second one consisted of Dave Anderson, Keith Morris, Dave Carr, and Ken Hunter. Jim’s team kept nipping away at their opponents and managed to get on level terms at five all after 6 ends. In the seventh end, they started on the front foot but ended up losing a two to finish 5-7 down. Dave’s team were under pressure in the early ends of their game, with their opponents playing well and establishing dominant positions. Dave did well to restrict 37 Club to a single in the first end, and after four ends Penicuik were 1-4 down. Penicuik managed a single in the fifth end, and a great final shot from Dave (wick in from an outside stone on the centre line to lie covered in the four foot) saved our bacon in the sixth end when a heavy loss loomed. The Final end was cat & mouse, with one side taking the initiative only to be outdone by the other side. Fortunately, it ended up going our way so the game ended up 4-4. A welcome refreshment was shared in the bar afterwards before Jim Ramsay presented the trophy to 37 Club and congratulated them on another victory. A fine night of sport in good company. Wow! What a finish to the Thirds League. Team Carr just either needed a point against Team Hobbs, or for Team Occleston to drop a point to Team Gillespie, in order to win the League. If they lost and Team Occleston won, then it would go to Ends then Shots Up. Team Carr just had the edge on both. Team Carr started a bit nervy, and Team Hobbs built up a well-deserved 4-1 lead after four ends. Meanwhile on the adjacent sheet, Team Occleston were even more impressive leading 6-0. The large crowd (Ronnie Hope and Dave Carr) were getting excited and checking the total ends and shots up. Team Occleston looked as if they were now ahead on both. Then Team Gillespie started a comeback, with a 4 at the 5th end. The sixth ends went to Teams Occleston and Hobbs. It looked grim for Team Carr, unless there could be a game changing final end. At last, Team Carr found their weight and built up 4 stones in the house with 2 stones left. Team Hobbs tried to reduce the numbers with a big hit but it was a bit wide and sailed through the back. Provided Team Carr didn’t do anything silly with the last stone, they had pulled a draw out of the bag. The attempt at a draw to win the game pulled up well short for a final score of 6-6. On the other sheet, Team Gillespie had also found their weight and were piling in the shots, a nice draw to the front of the house with the last stone gave them a 4 and for a 8-7 win. What a finish! Big turnarounds in the last ends of both games, and victory in the Thirds League to Team Carr. Team Carr finished on 9 points, with Teams Occleston and Gillespie both on 6 points. Whilst this looks comfortable, it was anything but on the night. Well done to all 4 teams for an excellent night’s entertainment, and congratulations to Team Carr (Margaret Carr, Christine Hope Mike Mauchline and Vic Ramage) on their success in winning the Hope Quaich. I’m sure that the nerves of the players and the crowd will settle down in a few days! This entry was posted in Uncategorized on March 14, 2019 by captainken45. The Club Pairs Competition was played on Sunday 10 March. In the opening encounters Ramsay & Hunter beat Morris & Brown, Anderson & Carr (M) beat Carr & Ramsay (P), Jacobs & Lambie (J) beat Hope & Gillespie, and Lambie & Scott (R) beat Scott & Noble. On to the Low Road semi-finals; Carr & Ramsay (P) beat Morris & Brown, and Scott & Noble beat Hope & Gillespie. In the latter game, Ronnie astounded the ‘Gallery’ of onlookers with a reversed angle, raised shot using an opposition stone to just nudge one of his own stones on the edge of the four foot to take shot, it was perhaps the best fluke of the day. Carr & Ramsay (P) met Scott & Noble in the Low Road final. Carr & Ramsay got off to a great start gaining a 4, largely as a result of a fine double by Dave Carr with his first/second shot (poor memory of the detail here). Iain made a good draw with his final stone in the second end to add to the one shot that he and Jean were already lying to make it 4-2 to the Carr Ramsay combo. Scott & Noble managed to steal a single in the third end to go into the final end one down. With two stones to go things were not looking to good for Scott & Noble, but Iain managed to get a good draw in on a difficultly straight out-turn to take shot, Having to move this stone, Dave came up a little too wide and got no draw. Iain then attempted to repeat the same draw, was slightly heavier and although he lay two shots it appeared to give the opposition a reasonable chance. However, Dave was again slightly wide of where he would have liked to have been and wrecked on a front stone. So Iain and Jean were winners 5 shots to 4. In the High Road semi-finals Anderson & Carr (M) had a comfortable win over Ramsay & Hunter, with Margaret making an excellent out-turn tap back through a port in the second end. Jacobs & Lambie (J) beat Lambie & Scott. Anderson & Carr (M) met Jacobs & Lambie (J) in the six end final. The latter stages of the first end were dominated by shots on a tricky straight in-turn. Dave found a good line past front stones to take shot just to the left of the four foot. John managed to get a tap back on this shot and took a single when Dave failed to repeat his earlier shot. Anderson & Carr exerted pressure in the second end only for John to get a wick in off a stone in the outer part of the house to lie shot. In trying to deal with this Dave somehow manged to contrive to remove his own stones and, instead of losing a single, gave away a four. Anderson & Carr came back well in the third end and took a three to go 5-3 down. They had much of the better of things in the fourth end; lying with four shots diagonal across the front of the house from, Dave played his final shot a little too heavy and came to rest past the tee line. John made a good draw to that stone to take a single and go 6-3 up. Anderson & Carr again pressed hard in the fifth end and John was only able to keep them to two counters. His final shot on the swingeing out-turn was quite good giving him shot, but it was marginally too heavy and gave Dave an opportunity to respond. Dave made the most of the opportunity and was able to move John’ s stone; the outcome, after a measure, was a three to Anderson & Carr. So all level after five ends. Margaret manged to get two decisive stones in in the early part of the final end. Janette get a freeze on the better of these on the tee line at the right hand side of the pot lid, but did not lie shot. With the left side reasonably covered, Dave opted for an out-turn draw, he may have been a little tight for his nominated shot but a slight wicked off a front stone provided an excellent guard. John was now left with little option but to try a very difficult raise on the very swingeing in-turn. His first attempt looked slightly light but was compromised by a pick up. Dave attempted a guard on the same hand but did not get the result he was seeking. John then tried the raise again without success, only for Dave to get the guard on with his final stone. John was left with a difficult raise on the tricky out turn which was unsuccessful. So Dave and Margaret ran out winners 7 shots to 6. Again the Pairs Competition was a successful and enjoyable day. Thank you to everyone who entered. This entry was posted in Uncategorized on March 11, 2019 by captainken45. We had a full complement of 24 for the mid-bonspiel. As with tradition, the ladies skipped. There were an ideal number of 12 women and 12 men. Gillespie. Liz won with a convincing +10. This entry was posted in Club, Competition, Social on March 4, 2019 by captainken45. 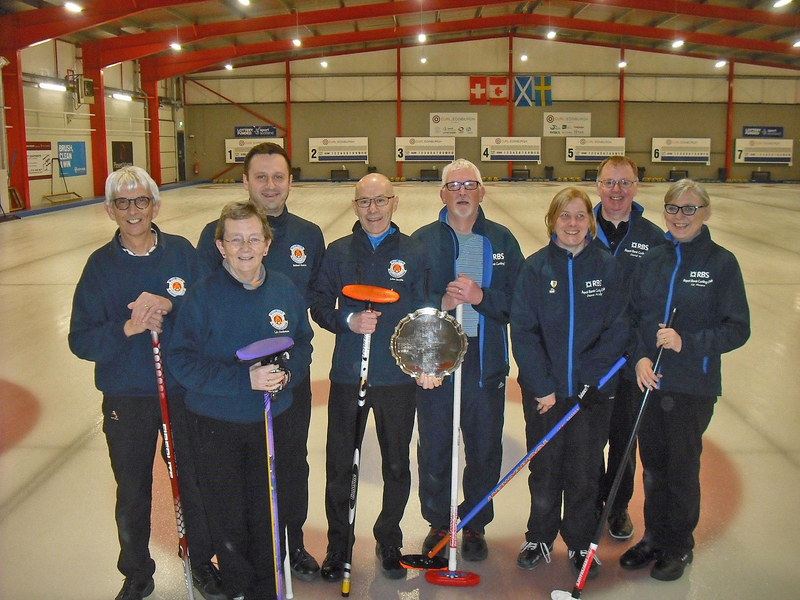 The President’s rink of Jim Ramsay, Robert Beaton, Murray Hope and Ronnie Hope along with the Vice –President’s rink of Dave Anderson, Dave Carr, Iain Scott and Margaret Carr took to the ice at Braehead on Saturday 2 March to play for a District Medal against Helensburgh. Both games were hotly contested on what was quite tricky ice with the President’s rink gaining the advantage to go 3 shots up in the first two ends. Helensburgh had a difficult last stone draw against 7 shots which the skip executed to perfection to take a single. 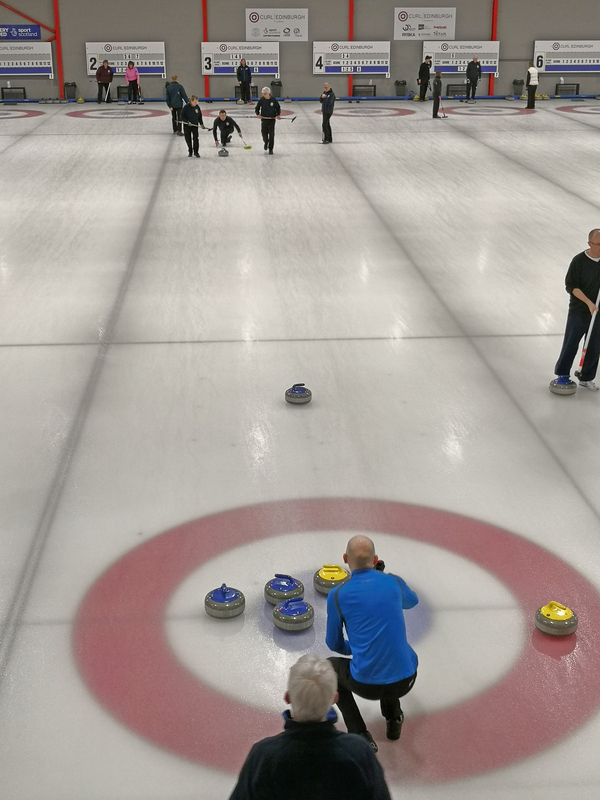 This seemed to shift the momentum in their direction and they took the next three ends to go into the final end 5-3 ahead but Jim managed to get a single to finish the game Helensburgh 5 shots and 4 ends – 4 shots and 3 ends Penicuik. The Vice President’s rink in the meantime had a last stone draw against 4 in the first end to only lose a single. The second end went Penicuik’s way with an angled plant to remove the opposition stones to gain 4 shots. The next end needed a last stone draw to cover the button with some frantic sweeping to gain us a single then two shots in the 4th end gave us a good advantage but Helensburgh came back with 2 shots in the 5th. The last two ends went with the hammer with 3 shots to Penicuik then 2 to the opposition with the game finishing Helensburgh 5 shots and 3 ends – 10 shots and 4 ends Penicuik. So the overall result was a win to Penicuik 2 points, 7 ends, and 14 shots against Helensburgh 2 points, 7 ends and 10 shots. This entry was posted in Uncategorized on March 3, 2019 by captainken45. 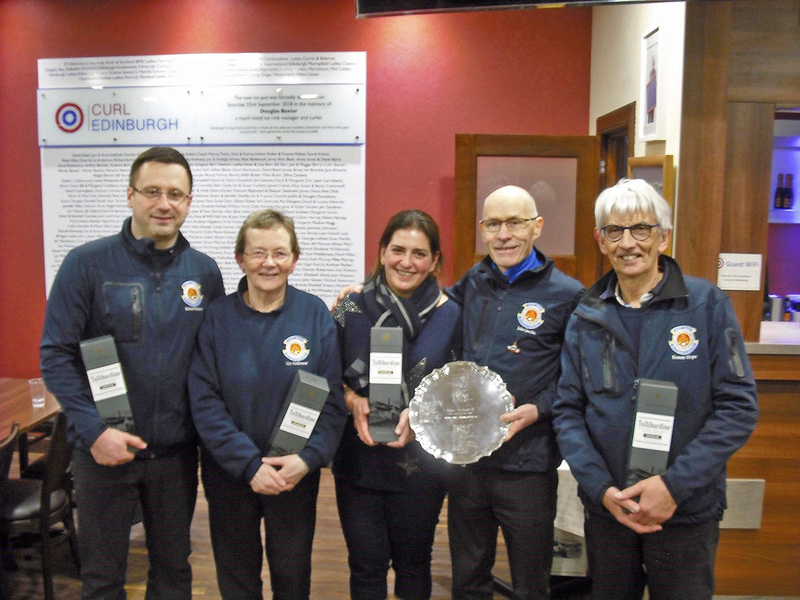 Penicuik contested the final of the King George knock-out competition (Midlothian Province) against RBS last night (1 Mar), and came away victors. Congratulations and well done to our team of John Jacobs, Robert Beaton, Ronnie Hope, and Liz Anderson. Penicuik beat RBS in an exciting ﬁnal of the King George IV Trophy Competition on Friday 1 March. First competed for in 1965-66, originally for curlers who could not take part in “daytime competitions”, (when the majority of them were held), the deﬁnition has changed slightly over the years. It now excludes curlers who play in The RCCC organised Rink Championship and the Midlothian Province League Division 1. This is the ﬁrst time that Penicuik has won this knock-out competition, and followed wins against Stewart’s Melville FP, Holyrood, DAFS, and Sweepers in previous rounds. For the third consecutive game the Penicuik rink remained unchanged: John Jacobs (skip), Robert Beaton (third), Ronnie Hope (second), and Liz Anderson (lead). Ken Hunter played as skip in the ﬁrst round, but was debarred from playing in later rounds after entering the Rink Championship as a substitute. Keith Morris stepped up to the plate as Skip in the second round and played a great last stone against Holyrood to secure victory, with Craig Brown playing in place of Liz Anderson. Whilst the 9-3 score in the ﬁnal would indicate a comfortable victory, in reality this was a “Close Encounter of the Squeaky-Bum Kind”! Following a single to RBS in the ﬁrst end, Penicuik responded well with a two at the second and a single against the head at the third. 3-1 up, and looking good, slight nerves crept into the Penicuik rink and RBS struck back with a single at the fourth and another, very fortunate, single at the ﬁfth. 3-3, and for a moment Penicuik looked in trouble. Penicuik guards on to the RBS stone. John played a perfectly weighted stone to push the RBS stone back without touching his own and take a four! Penicuik held their nerves in a tense ﬁnal end, and stole a two to end the game 9-3 up. Every game in this competition has been played in the best of curling spirit, and RBS proved to be great fun to play with and generous in defeat. Following a friendly drink in the bar, the Midlothian Province president, Basil Baird, introduced Shadi Darvish, MD of the sponsors, Bridge Investments, who presented the trophy and prizes. This entry was posted in Competition, External on March 2, 2019 by captainken45.